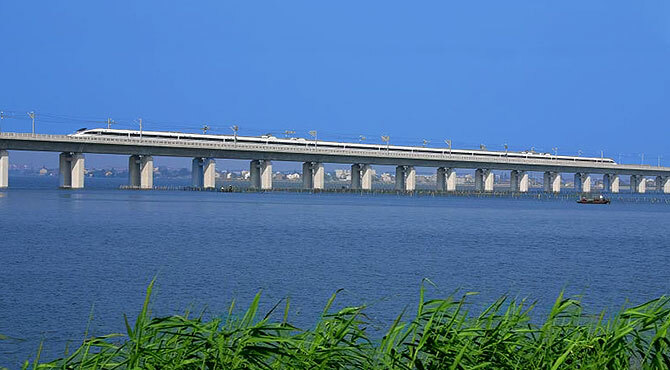 (Danyang-Kunshan Grand Bridge) , on the Jinghu High-Speed Railway (aka Beijing–Shanghai High-Speed Railway) is 164 km (102 miles) long. This new line (open from June 2011) also crosses the 114-km (70.8-mile) Langfang–Qingxian viaduct, the second longest bridge in the world. Tianjin Grand Bridge is a railway viaduct bridge that runs between Langfang and Qingxian, part of the Beijing–Shanghai High-Speed Railway. It is one of the longest bridges in the world with a total length of about 113,700m, or 70.6 miles. It was completed in 2010 and opened in 2011. As of 2011 Guinness World Records recorded it as the second longest bridge in the world.